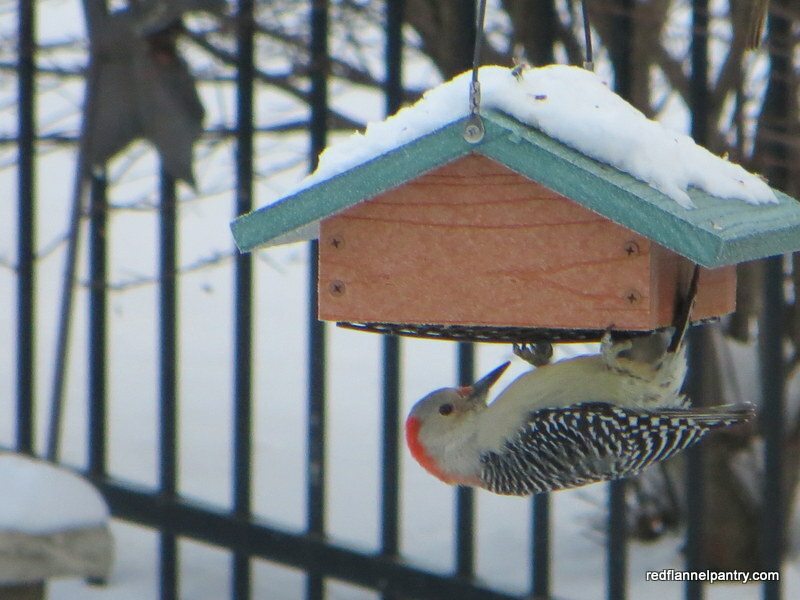 I had a first taker for the suet I made: a female red-bellied woodpecker. Based on others’ observations and insights, I’ve temporarily removed the peanut feeder, and that seems to have eliminated starling visits, at least for now. I’ve read that although starlings can’t hang upside down to eat like woodpeckers, they will do their best hummingbird imitations in their attempts to reach suet in this type of feeder–that’s something I’d like to see! Nuthatches, woodpeckers and chickadees can feed from below, so I’m looking forward to other visitors stopping by. 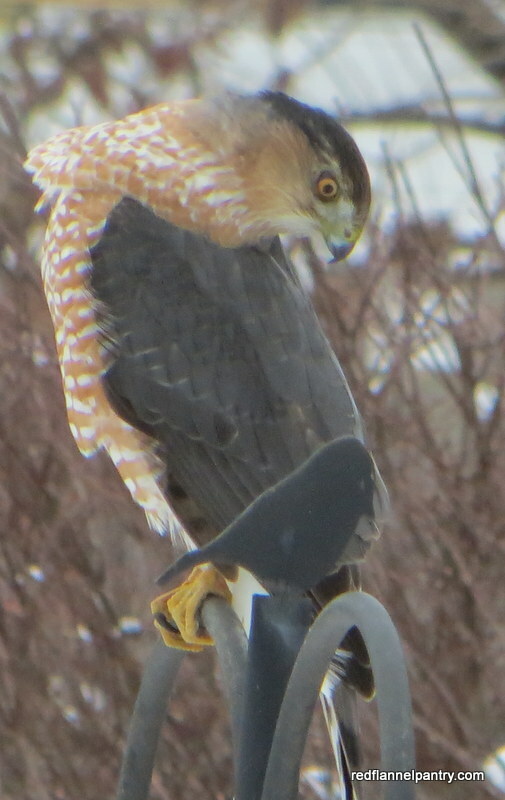 Our resident hawk paid a visit today, landing atop the feeder pole and looking at the little decorative metal bird as if to say, I was planning to eat you! His visit reminded me of the last time I saw him. It was a snowy day a few weeks ago. I had gone out to shovel and noticed that the bird bath was running low. I returned inside to fill a plastic pitcher with water when I saw that a greedy group of starlings had descended on the peanuts I had left on a patio table. Squawking and tumbling over one another in a dizzy flurry of feathers, they were oblivious to the hawk, who swooped down and plucked one from the crowd. The survivors scattered. 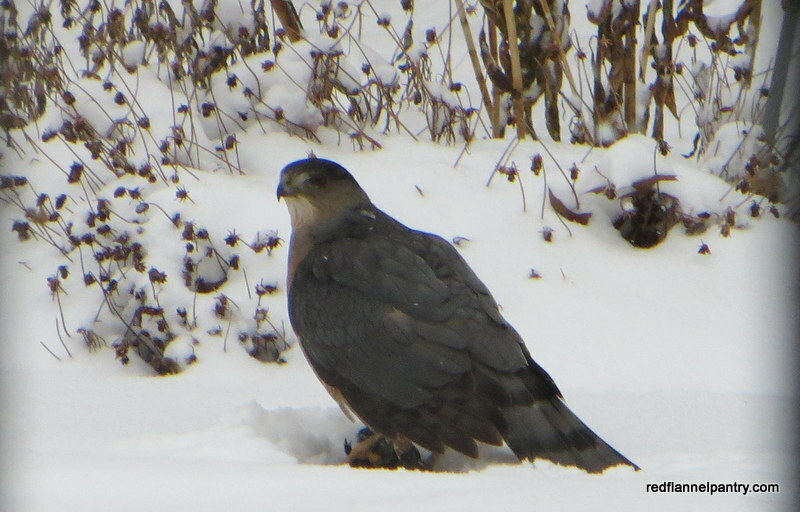 Clutching his prey, the hawk landed in the snow a few feet away. Each time the unfortunate starling struggled, the hawk gripped tighter. After a few minutes, the hawk flew off with his meal. I’ve been thinking about making suet for a while. I researched it online (lard vs bacon grease? ), ripped recipes out of Birds & Blooms and saved plastic suet containers. 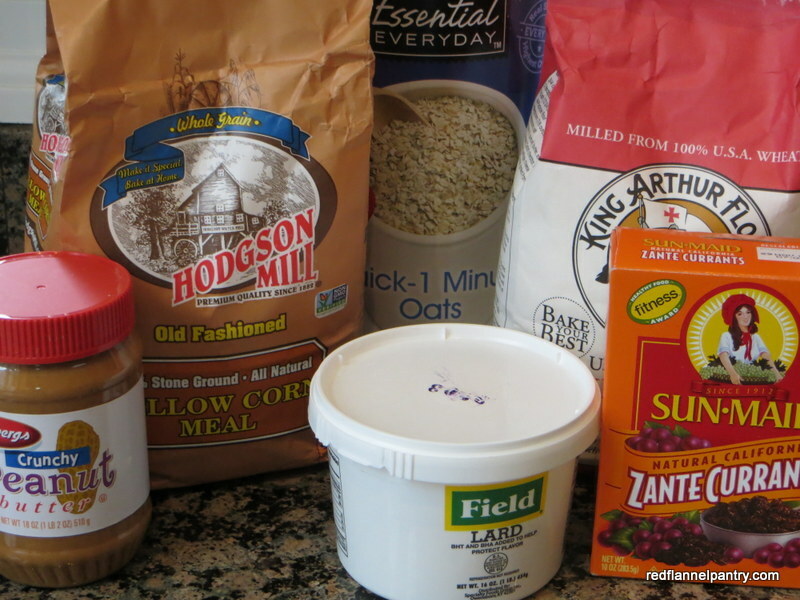 Then last week out of the blue my friend Sally handed me a suet recipe she had gotten from Roy and Charlotte Lukes, long-time Door County Wisconsin naturalists–it was a sign to get cooking! Daughter #2 helped me. Photobomber Bud was thinking we were whipping up an afternoon snack for him. You can find the Lukes’ recipe here. I thought it would be difficult to find lard at the grocery store, but there it was, in the refrigerated section by the hams. 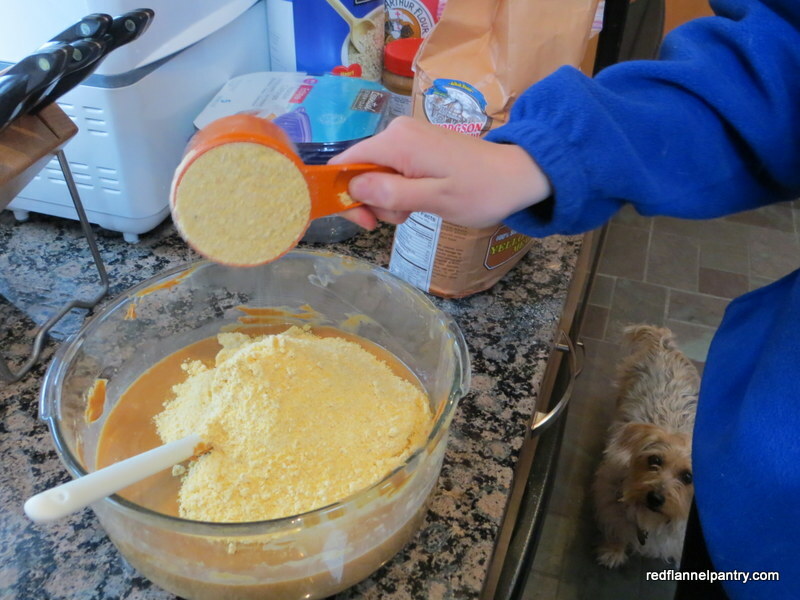 I followed the microwave method of melting the lard and peanut butter, and then I dumped the rest of the ingredients on top and stirred to combine. I also added a box of currants that were past their prime. 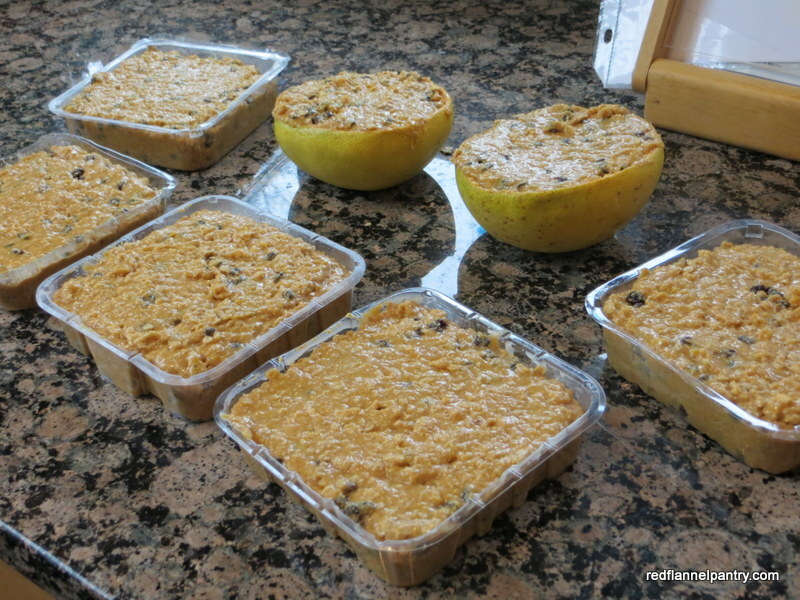 I scooped the mixture into the 9-oz suet containers I had saved and a couple of grapefruit halves (thanks, Kate and Ken!) and put them in the refrigerator to solidify. I’ll let you know in a couple of days what the birds have to say about my new avian catering business. As ground feeders, the dark-eyed juncos are appreciating the safflower and thistle seed I scattered in the snow this morning. They have to do a little two-step scratching dance to find it in the quickly falling snow. 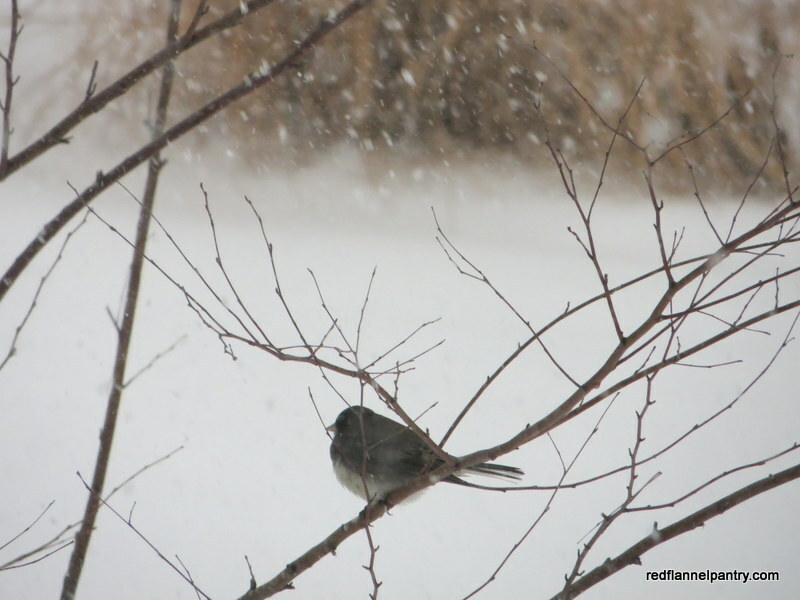 Against all of this white, the male juncos look striking in their two-toned formal-wear feathers. 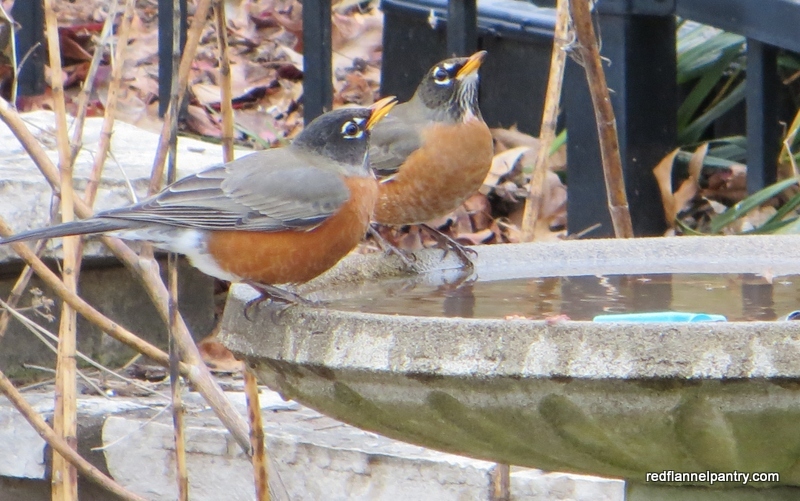 Although robins don’t eat at the feeders, they do appreciate fresh water in the bird bath. 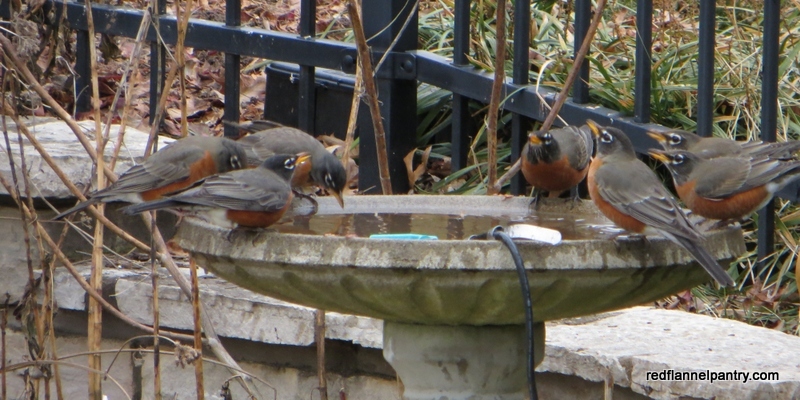 This clan showed up shortly after I cleaned the bird bath and added a couple of pitchers of water. When they tilt their heads back to swallow, you can appreciate the white ribbing beneath their beaks. 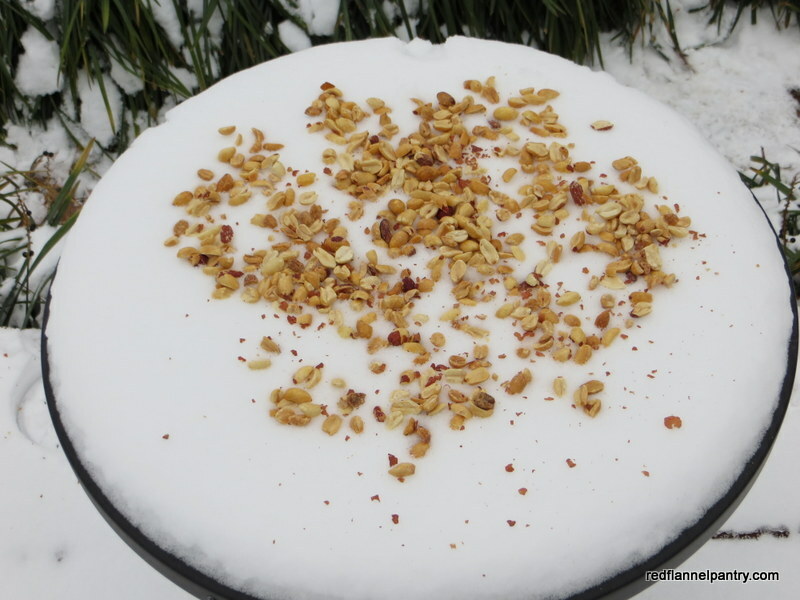 This morning when I filled the feeders and birdbath, I scattered some peanuts on a small table on the deck. 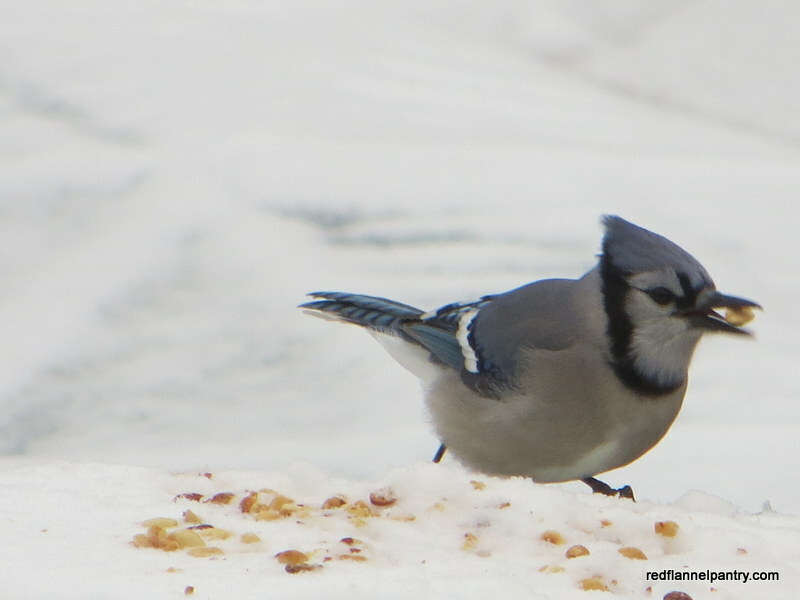 All of the birds are enjoying this treat, especially the blue jays. 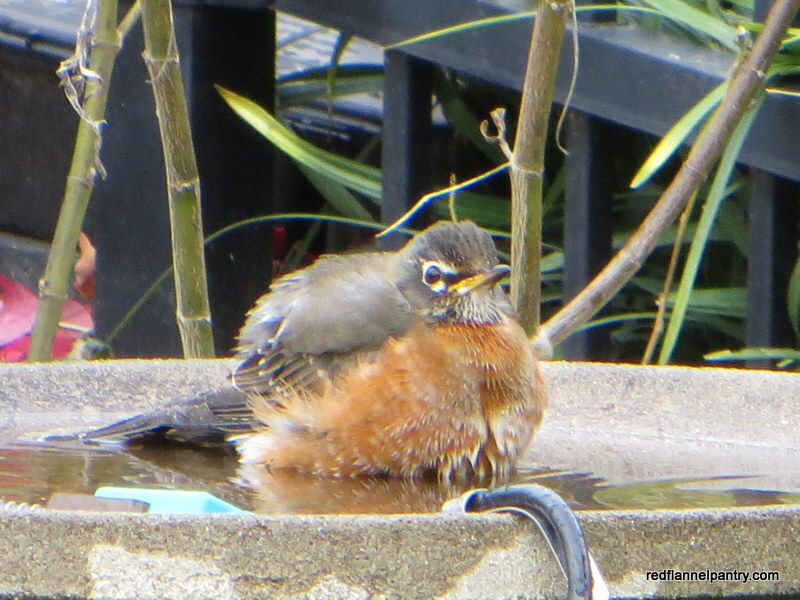 This morning I wondered why there weren’t any birds at the feeders, especially since I had filled the feeders and added water to the birdbath yesterday. 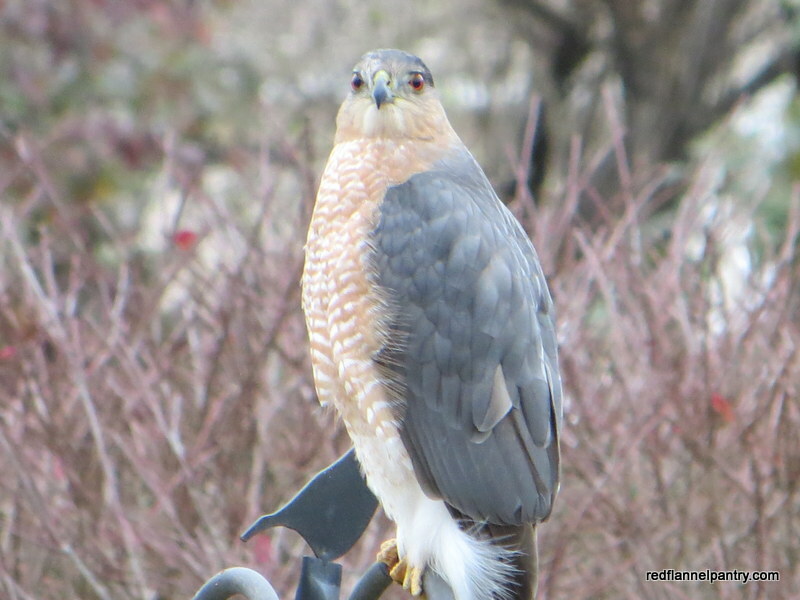 I glanced out the kitchen window and realized why: a Cooper’s hawk. He was sitting atop the birdfeeder stand, surveying his domain. 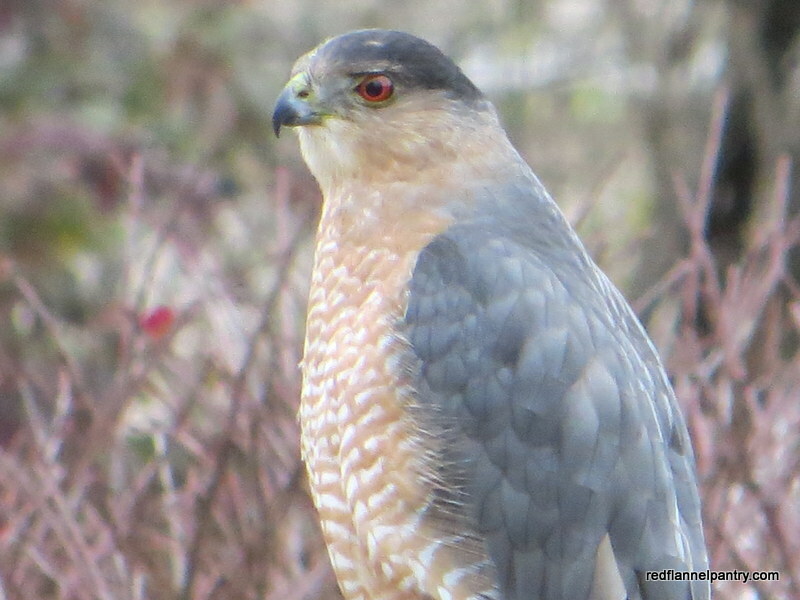 Although the Cooper’s hawk and the sharp-shinned hawk look similar, my guess is that, given the rounded tail, it was a Cooper’s hawk. 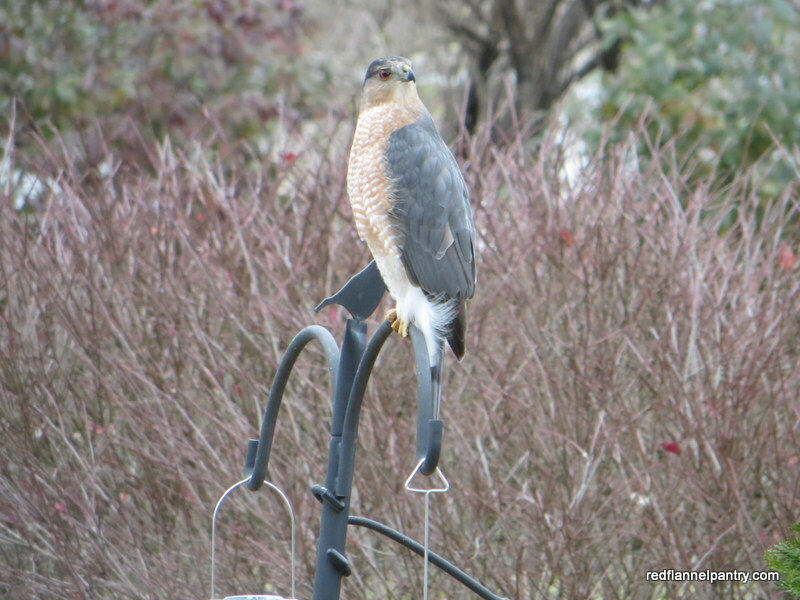 This hawk knows a meal ticket when it sees one–he’s a birdfeeder hitman. We believe his most recent avian victim was a mourning dove; we found the feathery remains near the edge of the lawn, which saddened us. This time, however, he swooped down to the lawn and grabbed a vole or mouse. Good riddance, I say! 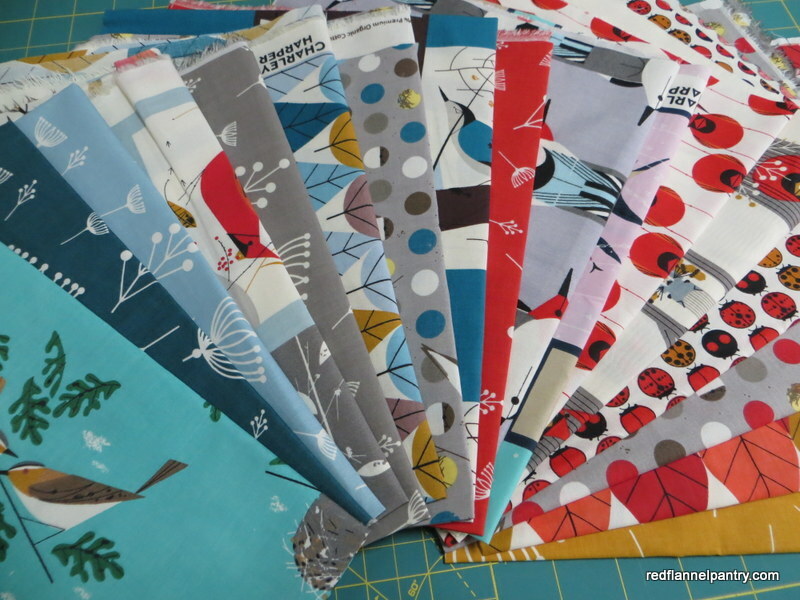 I finally received the pile of fat quarters of Charley Harper fabric I ordered from Fabricworm–I’m psyched! 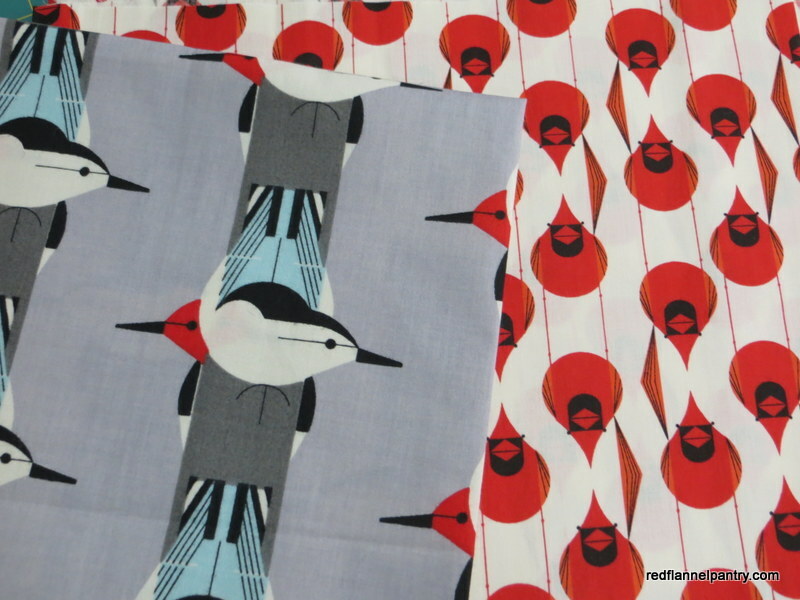 I am a long-time admirer of the work of Charley Harper, so I was thrilled when I heard that Birch Fabric was coming out with a line of fabric based on his designs. These two prints are my favorites. Although I have yet to see a red-headed woodpecker in my yard, cardinals and nuthatches visit my feeders daily. 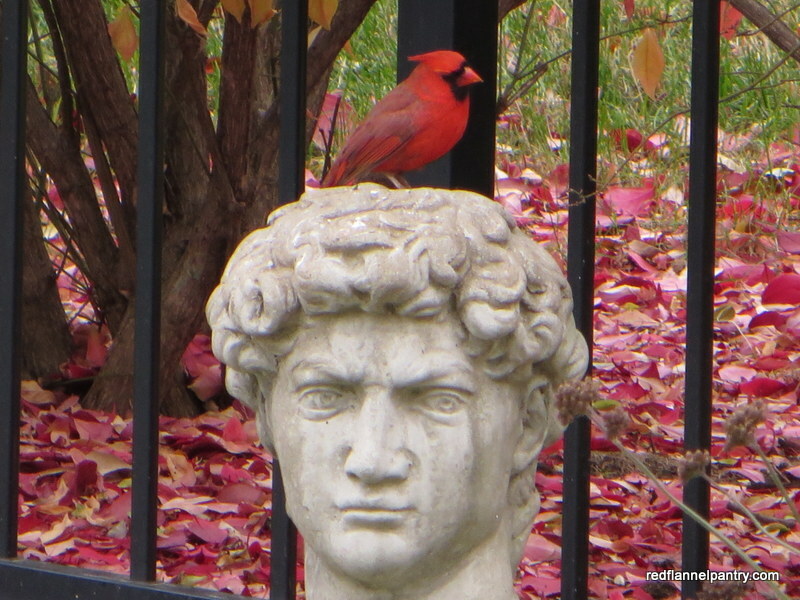 This cardinal stopped to give David a bit of style and flair! I installed the heater and filled the bird bath yesterday. 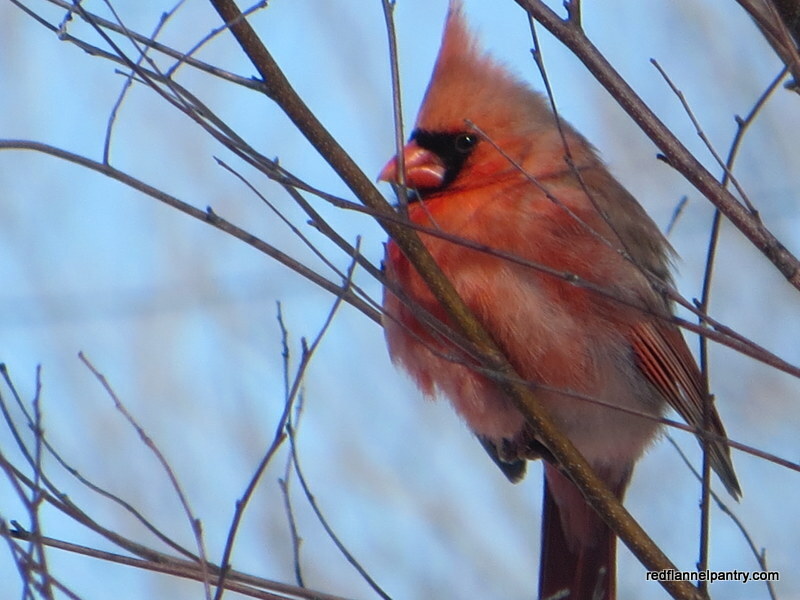 Today cardinals, sparrows and even blue jays are taking turns. The robins, however, are not so egalitarian. After chasing several other birds away, this fellow took an extended bath, fluffed himself up to dry, and then continued to have a long soak.